Reminder: Please contact your congress member and encourage him or her to oppose corporate cronyism in the form of reauthorizing the Export-Import Bank (see below). New Mexico DOES NOT BENEFIT from the Export-Import Bank and there’s no reason the New Mexico delegation to congress should support the reauthorization. Or if you would like to contact Congressman Pearce’s district staff (or see if he’s in your area! ), you can find that information on the sidebar here. 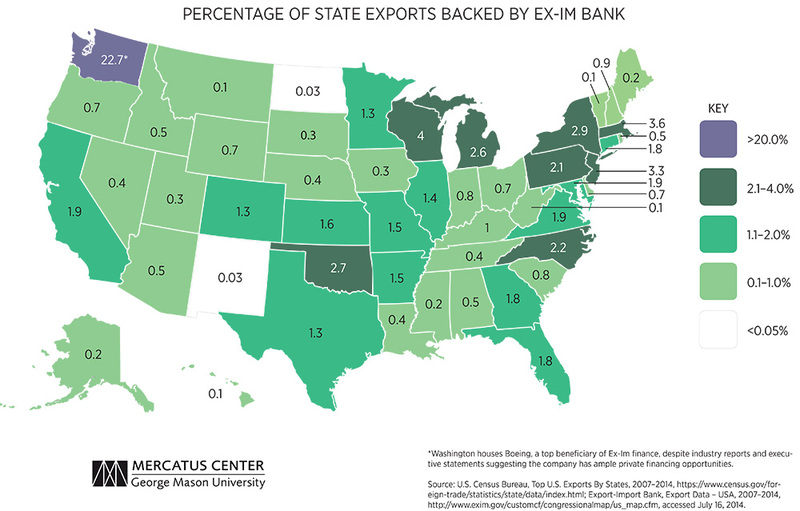 What does the Ex-Im Bank do and why should we vocally stand up and oppose it? Government subsidies work by taking tax revenues procured from other businesses and redirecting them towards lucky targeted sectors and businesses, like agricultural interests who benefit from the farm bill or, in the case of the Export-Import Bank, export-driven manufacturers like Boeing and Caterpillar. Politicians and subsidy recipients frequently justify the practice of subsidizing private industry with public revenues on the basis of “saving jobs,” “stimulating industry,” or “protecting domestic production,” but in reality, subsidies lack support in both economic theory and in practice. First, subsidies transfer resources away from low- and middle-income Americans and small businesses towards large, well-connected corporations. Sometimes, this regressive effect can be compounded by higher prices of the subsidized good. In the case of higher education, for example, tuition costs have been consistently rising in tandem with expansions of government loan subsidies to students. Universities take advantage of the knowledge that Uncle Sam will take care of the bill by raising tuition levels to the ultimate detriment of students. Second, the subsidies can trigger waves of malinvestment by encouraging companies to invest in a subsidized area they wouldn’t enter otherwise, or by encouraging a consumer to buy a subsidized good independently of its merits. Fourth, subsidies dull recipients’ competitive edge and may ultimately undermine their long-term viability. Subsidized businesses often grow complacent and lazy because they know they can rely on government assistance. When markets change and pressures mount, subsidized industries often find that they simply cannot keep up – so they come knocking to Congress for a bailout. More charts and breakdown of the above charts here. Right now our congress members are enjoying their August recess…but when they return to D.C. our legislators will vote on the reauthorization of the Ex-Im Bank. It couldn’t be a better time to ask our members of congress to oppose the Ex-Im Bank. In addition, we should be contacting our congressional delegation via email, Facebook and Twitter RIGHT NOW to let our congressional members know they should OPPOSE the reauthorization of the Ex-Im Bank. With Heritage Action’s email form, it is easy to let your two U.S. Senators and Congress member know where you stand on the Ex-Im Bank reauthorization. 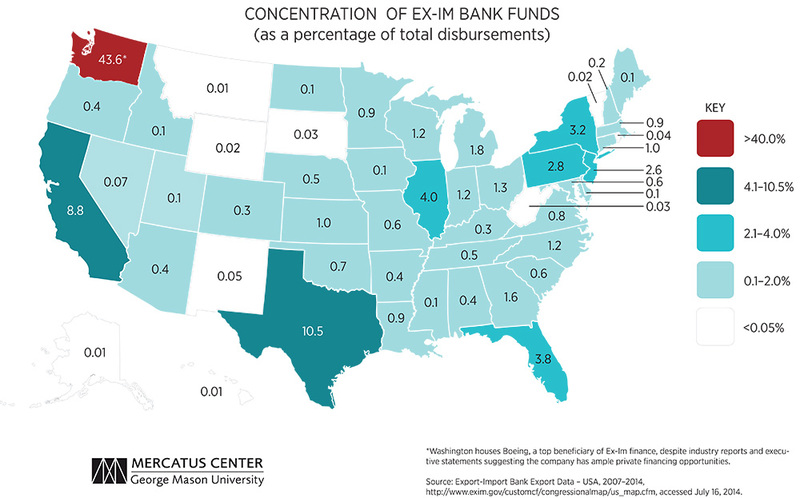 Want more information on the Ex-Im Bank? Would you like to become more vocal in opposing it? Send me an email here. Next Post: Mayor Berry vetoes marijuana vote for ABQ…Ain’t that just too bad?